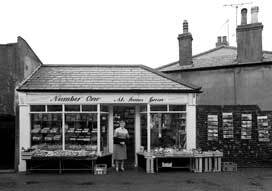 This miniature and simply built corner shop was designed for Fred Barber and his wife by teenager, F R Rowe, as a student project. He went on to pursue a career as a draughtsman. F R Rowe's daughter, Heather Osmer, kindly provided the photograph of the Barbers outside their new shop. F C Barber (Fred) - Tobacconist, Confectioner, Fruit and Vegetable vendor. (K1933, K1937, SRB1939). Fred Barber also ran the beachside cafe/kiosk below Centrecliff. See advertisement right. 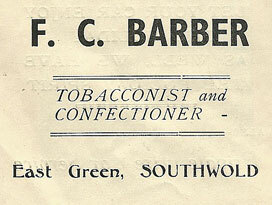 F C Barber (Fred) - Tobacconist, Confectioner, Fruit and Vegetable vendor. Name? 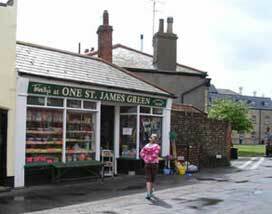 Confectionery, groceries, fruit and vegetables. 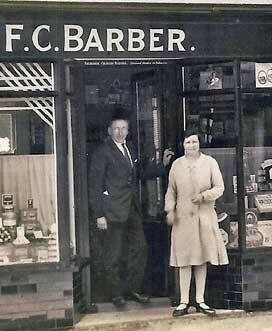 Fred Barber and his wife posing outside their new shop in the early 1930s. 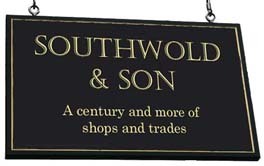 1936 advertisement in Southwold Visitors List. The address was then considered to be in East Green. 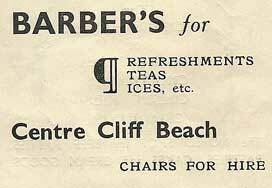 The Barbers also ran the refreshment kiosk on the promenade below Centrecliff. See below. Two ads above courtesy of Margaret Turnbull. Marie Waters at No 1 St James Green.